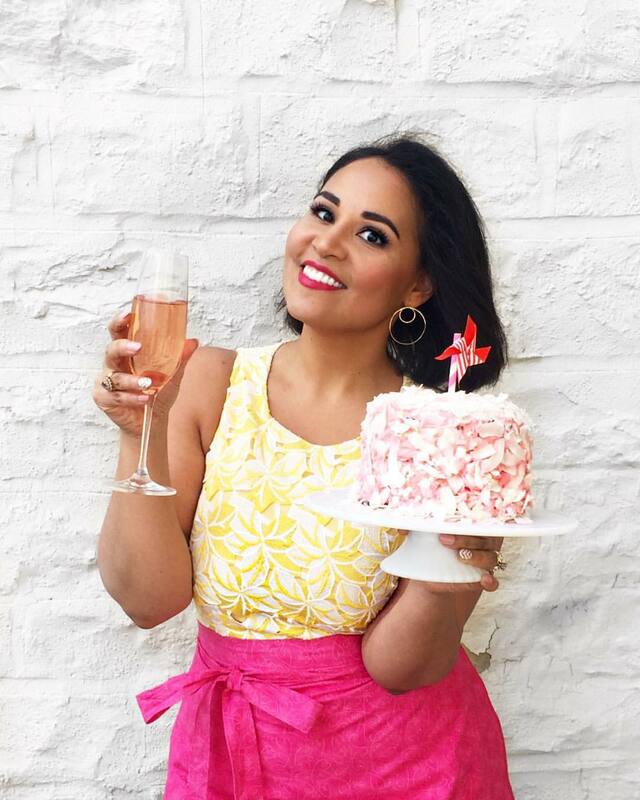 As part of my wedding planning, I’ve been spending quite a bit of time lately thinking about cookies and candies that can be made in advance. Though I haven’t really figured out the specifics yet, I’ll likely end up making several different kinds of these make-ahead treat to use either as favors or on a dessert table, or perhaps even served on platters of mignardises to be set on each table post-dinner along with the cake and coffee. The latter solution made me think of the classic cantuccini that were served along with tiny cups of Vin Santo after dinner at nearly every restaurant in Florence. 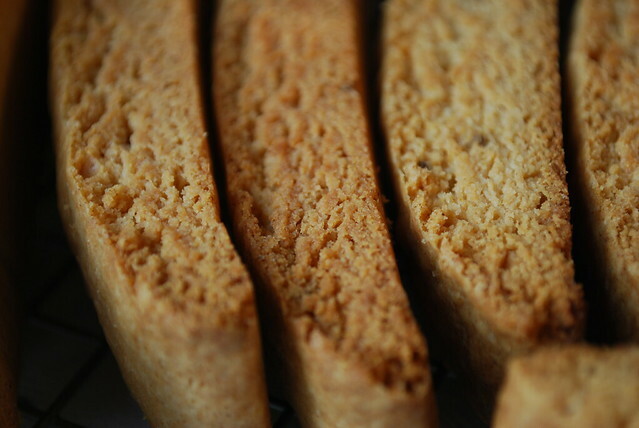 A classic Tuscan treat, the cantuccini are tiny, dry little biscotti-type cookies that are meant to be dipped in the sweet wine (or coffee) for a bit of sweetness after the meal. When I went back to New Jersey after my time in Florence (where I went to culinary school), I brought my dad a bag of the little hard cookies and a bottle of Vin Santo to try, and we ate them after our dinner for weeks after my return. 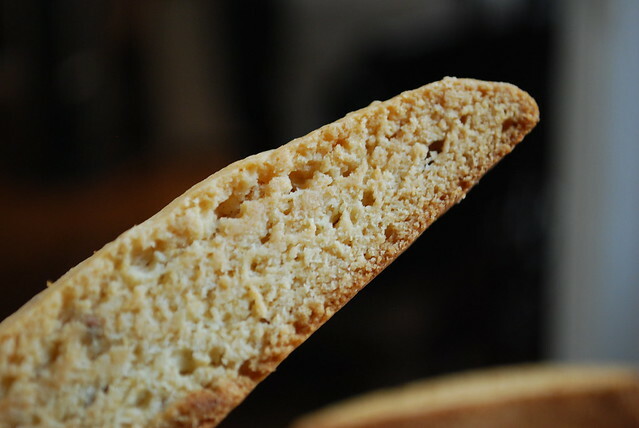 Cantuccini, and other types of biscotti, are perfect after a large meal, and convenient for the hostess as they can be made well in advance since they’re supposed to be stale to better soak up coffee. 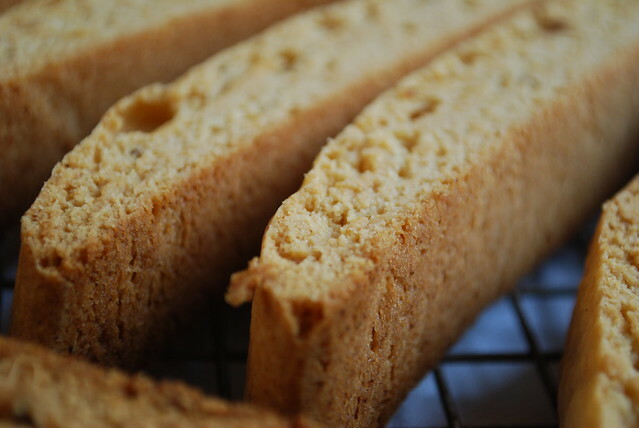 Anise biscotti, in particular, have always been of favorite of mine. I use pure anise oil instead of extract for a stronger flavor without as much moisture (you can use about half the amount of oil as you would extract; often even less than that) and add whole anise seeds for a little extra texture and flavor. If you prefer almond, you can substitute that extract instead. Oh and you should know that these turn out a little softer than the kind you’d get at the store (or by the Starbucks register). They’re hard, but not break-your-teeth hard—just dry and firm enough to be perfect for dipping. Preheat your oven to 350 degrees and place the rack in the center of the oven. Line two large baking sheets with parchment paper or a silpat. In a large bowl, sift together the flour, baking powder, salt, and anise seeds. Set aside. In another bowl, combine the melted butter, olive oil, sugar, extract, anise oil, and zest. Whisk in the eggs one at a time until each is combined well. Add the dry ingredients to the butter mixture and stir until completely combined and no dry bits remain (the anise seeds should be well distributed throughout the batter). Dived the dough in half and shape each half into a long log down the center of the baking sheet. (don’t worry if it spreads a little bit, it’ll rise in the oven). Bake each batch for 30 minutes (you can bake both at the same time if your oven is big enough). Pull the logs out of the oven and let cool for about 10 to 15 minutes before using a sharp knife to cut slices in the longs, each about 3/4 inch thick. Turn the slices over onto their sides and bake again for about 10 minutes then flip the slices to the other side and bake for another 10 minutes. Remove from the oven and transfer to a rack to cool completely. Once cool, these can be stored in an air-tight container in a dry environment for up to 2 weeks (sometimes even longer).